Translation: Megumi Tsuruoka to feet all the modern needs of technologies and accueil. Their speciality is to offer an exclusive service ad hoc for all kind of guest. They can make your stay in Napoli really unforgettable. 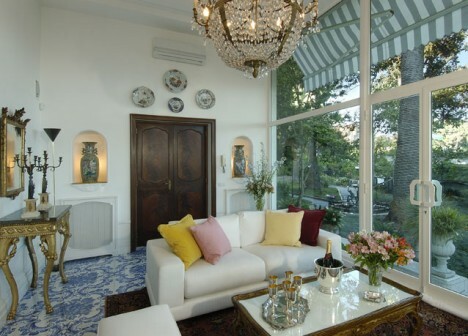 Nice rooms with antique furnishing and modern accessories. The house a great garden and a really beautiful swimming pool. You can stay in the Posillipo hill, watch the gulf of Napoli and Capri from the garden, have a great chef that cook for you and also a pleasure bio bar. The incredible staff is always there to follow your needs and to help you find the real napolitan warmth hospitality. You can ask for a massage or for a city tour, or a theatre events, they are always ready to answer. Villa Marechiaro si also perfect for business launch or meeting or as a location for film, photo set and so on.